Diabetes is caused bynot having enough insulin. 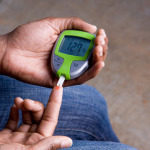 Insulin is a hormone that helps turn glucose (from the food you eat) into energy. Teens with diabetes can do normal activities with the right diet, exercise, and medication.